We are happy to understand you the matter. Color / Black. We will make every attempt possible to resolve the issue if we made a mistake. Worst two months. If there is a problem, we can work together to resolve the problem. They can be used in display in your porcelain cabinet. Ganzhou is located in Jiangxi province. Archeological discoveries show many ancient kilns in Qilizhen in the east suburb of Ganzhou. No restoration. Color / Black. We are happy to understand you the matter. We will make every attempt possible to resolve the issue if we made a mistake. We have collected the all kind of Japanese antiques. Also to get proper amount of compensation in case of item breakage. Yongzheng Marked, Qing Dynasty. Rare Antique Chinese Black Glaze, Tri-color Famille Rose Porcelain Cup. Gold Gilt around the margin of the cup. Song Dynasty Jian Yao Hei You (Black Kiln) Bowl. I will provide you my best service! 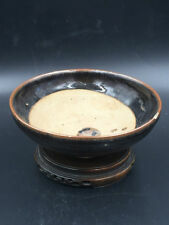 Song Dynasty Jian Yao Hei You Tie Hua (建窑黑油贴花）Bowl. ). ANTIQUE CHINESE FAMILLE NOIRE PRUNUS BOWL IN GOOD ESTATE CONDITION. There is a chip on the rim. I ACTUALLY LOSE MONEY WHEN CONSIDERING THE COST OF BUBBLE WRAP, BOXES AND OTHER SUPPLIES. They date to the late Qing dynasty or early Republic period. It is marked on the bottom. Nice gift for cloisonne collector. I have acquired many black Cloisonne pieces that will be listed soon. Keep looking! Gorgeous example of Cloisonne made in China in the early 20th Century. The black and green floral pattern on these bowls are wonderful with the threads being very smooth and detailed. Wonderful antique 1840’s-1890’s deguerrotype of a young girl and boy . Girls picture is covered by glass over gold oval frame. On boys pictures the glass is under the gold oval frame. Shipped with USPS First Class Package (2 to 3 business days). We are very willing to accept everything. and I will do my best to help you to solve the problem by communication. So only by friendly communication，is to resolved the problem a good way. Materials: Porcelain ceramic. Song Dynasty Old Jian Yao Hei You Bowl. I will provide you my best service! Thin black lines have been used to outline and accent the design. There is a thin gilt edge to the plate. The inside of the bowl and underside of the plate were left unpainted. A beautiful pair of porcelains marked in period during the Guangxu emperors reign. Also note that monitor settings may vary from computer to computer and may distort actual colors. Size: Length 15.3 cms Height 6.9 cms. Material: Porcelain. Condition: Item is in perfect condition, No chip, hairline, crack. Region of Origin: China. At the here, is the product collect, We have our own people go and collecte these stuff. it is good handwork; the item fully exhibits creativity spirit and brilliant culture. It has refined shapes and distinctive style. Large Chinese Antique Bronze Vase 20"
20" tall x6 " wide. I grew up in China and my fathers ( uncle and father) studied and operated Chinese collectors item for many years; they accumulated a lot of crafts experience, they understand the art style of each period! A pair of qing dynasty in ancient China in black porcelain dragon hip flask. Porcelain & Pottery. Only By Air. China has five thousand years of the vast history, very bright! History for us to leave a lot of precious culture, these cultures by many crafts to inherit! We can negotiate, we can make more money together! EXCELLENT CONDITION! See all pictures. This is the exact item you will receive. I encourage you to examine the photos using the magnifying feature provided for more detail. I try to describe the item as best I can but the photos will help you ascertain condition. Chinese antique culture enjoy worldwide reputation because of its unique. We have always been cooperated with Chinese Museum and many of our antiques are exhibited in Chinese Museum and I have been always making efforts to find antiques for Chinese Museum. Natural variable glaze. This collection is a wonderful SongDy Black Pottery Tea Cup.Sealing words on the bottom.Beautiful color with proper shape.Well worth your collecting. So beautiful Color changing like the rabbit's hair. Communication is the best way to resolve problem. This collection is a very rare Wood Lacquerware Square Cup.Beautiful work with proper shape.Well worth your collecting. A very precious Wood Lacquerware Cup. Wood Lacquerware Cup in good condition.One and Only.